A Day Sailing Cruise in Alghero! A day sailing charter on Andrea Jensen is a relaxing boat trip and a fantastic day at sea for all the family. Colin and Rachel are ready to welcome you on board this once in a life time trip. Our day trip appeals to all ages, including children and teenagers. 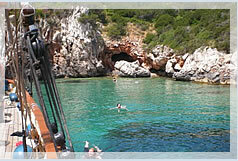 We are the only boat trip excursion in Alghero offering a days experience on a traditional, wooden sailing boat. Unlike most other boats operating out of Alghero harbour we specialise in small groups, enabling us to give you personal attention and leaving plenty of space for you to stretch out and relax along with your fellow guests. This is extremely popular with our guests and we are told time and again that this is what makes a trip on Andrea Jensen so special. Sailing, swimming, snorkelling, sun bathing, socialising, lunch and drinks are all included. To avoid disappointment we would strongly advise that you book early, before the start of your holiday. Email us or book on line. 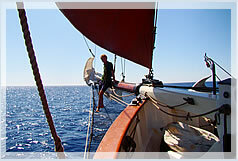 We only take small numbers of guests each day, which makes the day trip a unique sailing experience and very relaxing. No sailing experience is necessary. 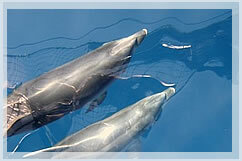 If you are lucky, you may even see dolphins swimming beside the boat during your fun filled day trip. Highly rated on Trip Advisor - Enjoy our fantastic day trip on the stunning crystal clear waters. Take in the fresh sea breeze, stunning coastline of the 'Coral Riviera' and beaches of Alghero, North West Sardinia, by taking a trip on Andrea Jensen, a traditional Danish, wooden sailing boat, the only one of its kind in Alghero, Sardinia. Our sailing excursion leaves daily and is one of the best things to do when in Alghero, an ancient Catalan port with an old, traditional walled city. We are located 15 minutes from Alghero airport. If you are currently on holiday / vacation in Sardinia and looking for 'things to do in Alghero', a family day out or a relaxing day on the sea, then please enquire by phone or email to find out when spaces are available. Ring us if you want to join us on our day trip today, we just might be able to squeeze you in! 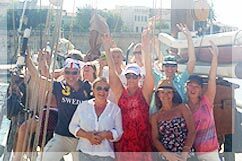 Join us on Andrea Jensen, the best sailing tour in Alghero. Please book and pay securely via the 'BOOKINGS and PRICES' tab.